OEM Style SatNav Integration with Touch Control for the Audi A4/A5/Q5 2008 Onwards with Concert/Symphony radio. New Version Now with Bluetooth and Dynamic Parking Lines. Our multimedia interface is a revolutionary product that allows you to add GPS satellite navigation system with a fully integrated touch controls to the original Audi factory fitted screen. Everything is provided in the kit to allow you to upgrade your system to add SatNav while at the same time retaining the original factory look and feel on the A4/A5/Q5 system which is not supplied with navigation as standard. The latest version of the interface now includes Bluetooth to provide you with a hands free car kit solution if your system does not have bluetooth handsfree as standard. It will also mute any source when making or receiving calls. Installation is plug and play and the transparent touch panel simply fits over your existing factory screen, you can then control your mapping system via touch and control all functions without the need for any remote controls, keyboards, separate screens or additional devices . You can easily switch to the Satnav at any time by holding down the 'Mode' button on your steering wheel, or by swiping the touch screen. All features and functions can be configured via an on screen graphical user interface which is operated via touch screen. Your existing features and functions of your original system, radio and screen will continue to operate as normal. 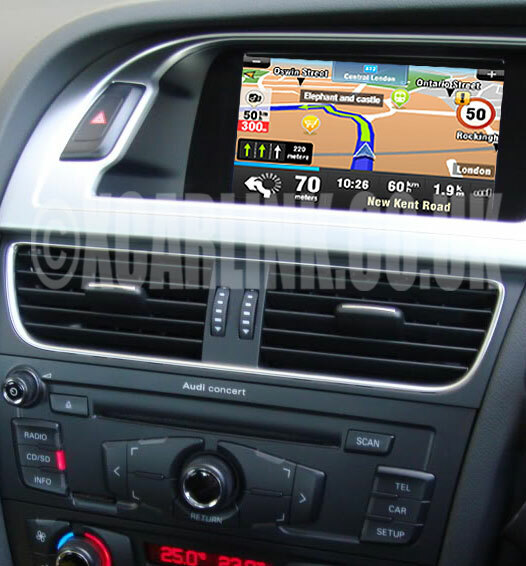 The Audi GPS Multimedia interface will also you to integrate any video source to your factory fitted screen such as a DVD player , Digital TV tuner etc. There is also a USB port allowing you to connect a USB stick to play video/music files on your system..
A dedicated rear view camera connection that automatically displays the camera on your OEM screen when the car as soon as the reverse gear is engaged. Dynamic parking lines are displayed which move with the position of the steering wheel so that the reversing path can be visualised. The mapping software is supplied pre-installed on an Micro SD card which fits to the Micro SD card slot built into the interface. Real Time Traffic - Real Time traffic lets you know what lies ahead. Recalculate routs automatically to avoid traffic jams. Maps Also available for USA, Canada , South America, Australia and New Zealand - If you require any of these mapping options please select the option above for Other - Worldwide and then let us know in the 'order notes' what country you require. Integrated Bluetooth hands free solution with microphone - mutes radio and CD. Dynamic parking guidelines which move with steering wheel position. Integrated audio, Satnav audio plays through factory speakers and will also mute any other source being played such as CD , Radio etc. USB port for connecting a USB stick with Video files, music and control via the original screen via original screen menu. Easily switch to mapping system and toggle between video sources using the steering wheel 'mode' button or by swiping the touch screen. Two video inputs - Watch any video source on your original factory fitted screen. The interface connects to the monitor connections behind the screen. Connect the plug and play harness to the back of the radio. Add the touch panel to the front of the screen. Installation of this product will be performed at the user full responsibility.